Myself, Alix Marcus, Jake Marcus, Coach/Mentor Chris Mullins, and Endurance Manager Alison Magier Rosenfeld at Virginia Half Marathon. For most, September is a month that conjures mixed emotions. Some see it as a terrible month that brings the end of summer, while others get excited to get the kids back to school. Personally, this September has brought me to the start of a fantastic journey, as I will begin training for my first half marathon. This past year, I was lucky enough to be involved in the creation of Team Intestinal Fortitude. 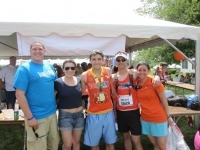 This is a “chapter” of the Crohn’s and Colitis Foundation of America, whose regional efforts are headed by Team New England, the team in which I will proudly be running with. Team Intestinal Fortitude was formed by friends Jake Marcus, and Jon Adams after Jake’s father, Stephen, had been diagnosed with Ulcerative Colitis. Ulcerative Colitis is a highly debilitating, inflammatory bowel disorder that causes chronic, daily pain, which was evident when I visited Steve at the hospital, or in his home. After a successful fundraising period, which included events such as silent auctions, golf tournaments, and yard sales, Team Intestinal Fortitude donated over $160,000, a first for Team New England. I am proud to have been involved with Team Intestinal Fortitude’s events, but I know that I can do more. On December 4th, 2011 I will compete in the 5th largest half marathon in the United States, in Las Vegas, Nevada. Not only is this race special due to the fact it will commence Team Intestinal Fortitude’s fundraising efforts for the year, but I will be sharing the racecourse with my close friends Tiffany Ko, Jake Marcus, Alix Marcus, and Duncan Payne. This blog will serve as a medium for those who want to follow my journey while I train for this half marathon. It is my hope that through various social media outlets we can raise awareness for the Crohn’s and Colitis Foundation, and get more people motivated to donate. Well, it’s time for me to run. I plan on doing 3.5 miles today at scenic Borderland State Park, one of my newfound favorite places to run! Keep up the good work Brian, I'm proud of you! Great Job Brian, keep up the hard work, I'm so proud of you!